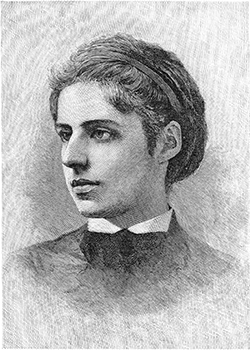 It’s been more than 130 years since Emma Lazarus died at the age of 38, but her immortal words on the base of the Statue of Liberty remain a potent symbol linking immigration policy and women’s rights. That connection is especially significant during March, Women’s History Month. Born into a wealthy Sephardic family, Lazarus worked as a volunteer on Wards Island with the Hebrew Immigrant Aid Society, assisting Russian immigrants who had escaped the pogroms. Their miserable living conditions influenced her writing. Now, fans of Lazarus’s message can follow in her footsteps—literally. Wards Island is a recreational park connected to Randall’s Island. Though the words from her poem “The New Colossus” were affixed to Lady Liberty posthumously, you can view the bronze plaque by taking a ferry to Liberty Island. Lazarus is buried at Beth Olam Cemetery in Ridgewood, Queens (Memorial ID 10018). In 2009, she was inducted into the National Women’s Hall of Fame in Seneca Falls, N.Y.